I know that I’m supposed to maintain journalistic objectivity about everything in the world of wine, but quite frankly, I’m madly in love with the wines of France’s Rhône Valley. I’ve always been especially smitten with wines from the Northern Rhône, which are much more rare than their cousins from the south. More expensive too, on average, but surpassingly complex and elegant. 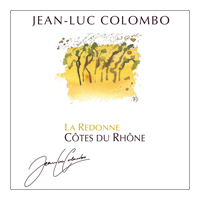 Across the duration of my long-standing romance with these wines, no one has been more influential in their development than Jean-Luc Colombo, an ultra-dynamic man who has not only made many great wines of his own, but also helped boost the quality of many other producers as well. I’ve admired Colombo’s wines for a very long time, but had never enjoyed an opportunity to meet him until earlier this month. He not only showed a set of his recent releases but also whipped up a sensational lunch for me, working at a speed that helped me to understand how he has achieved so many different things across his remarkably accomplished life. Or should I write, “lives?” Originally trained as a pharmacist, he migrated from southernmost France (near Marseilles), cracked into the wine trade by offering laboratory services, and rapidly built a consulting business on that foundation. Turning his prodigious energies and talents to viticulture and winemaking, he also led by example, turning out wines that were full of flavor--but not marked by the sort of quirks and flaws that had long been passed off as “ local terroir” notes. Stated a bit differently, Colombo showed that it was possible to make wines of character that derived their attributes from meticulously tended vineyards, perfectly ripened fruit, and carefully chosen cooperage--rather than “character” that was actually the result of musty old wood and slipshod cellar techniques. As a revolutionary of sorts (and an “outsider” on top of that), it isn’t surprising that some members of the Northern Rhône winemaking community weren’t entirely enamored with Colombo or the trends that he introduced. Perhaps I should have asked him whether that bothered him over the years, but it never occurred to me to do so…for a simple reason: Seeing him in person, slashing through one task after another with utter abandon, it seemed obvious that he’s a man too intent on what he’s doing to take much offense at what others opine about what he’s doing. 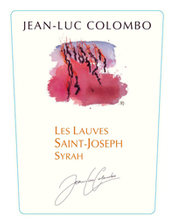 Considering his impact over a career (one that is far from over, and perhaps far from its apex), it is hardly an exaggeration to say that the distinction in the Northern Rhône between “traditional” and “modern” wines largely boils down to the question of whether they were crafted under Colombo’s direct or indirect influence. 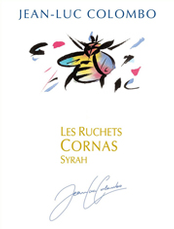 His sway has certainly been greatest with reds in general and the wines of Cornas in particular, but he has directly or indirectly influenced the way producers work on every grape and in every appellation in the region. Based on his own estate-grown wines, his négociant business, and his work with hundreds of consulting clients, he has steadily turned a host of innovations into standard practices. These include aggressive crop thinning, late harvesting, complete de-stalking of grape clusters, extended maceration, and prolonged ageing in newer oak barrels. Some detractors remain to this day, yet now it is they rather than Colombo who are in the minority. There is a very good reason for this outcome, and you can actually taste it in his wines. Stated simply, they are pure, and natural seeming, and delicious--whether tasted young or with time in bottle; they emphatically do not seem over-worked, nor do they seem like the hyper-correct wines that one might expect from someone who came to winemaking from a laboratory. On the contrary, they seem like wines made by someone who took his cues from a kitchen. A really good kitchen, where flavor counts first--but cleanliness and precision follow immediately thereafter (as they invariably do in really good kitchens). I would never have understood this not-so-obvious truth about his wines if I hadn’t had a chance to see him cook. Which is the only reason that I even mention having enjoyed a lunch that he prepared…as gloating is not my thing.